Jan 12, 2019; Syracuse, NY, USA; Syracuse Orange forward Oshae Brissett (11) looks to pass against the Georgia Tech Yellow Jackets defense during the second half of the Yellow Jackets' 73-59 win over Syracuse at the Carrier Dome. Mandatory Photo Credit: Kicia Sears, The Juice Online. Another year, another season spent on the bubble for Syracuse. The Orange sits at 17-7, its best record through 24 games since the 25-0 start to the 2013-14 season, yet Syracuse finds itself with work to do to make the NCAA tournament for what feels like the 70th year in a row. Despite all the potential this squad has shown, the key for a berth in the NCAA tournament and a potential run will be consistency. Since the start of conference play, this team has been all over the place. The Orange posted 65 points or fewer in five games, and eclipsed the 65-point mark six times. Defensively, the Orange have given up 65 or more points five times and held opponents under 65 six times. Syracuse has also had a tendency to struggle from 3-point range. SU has shot just 25.7 percent from behind the arc in its seven losses this season. Make no mistake, this is a talented group and an outfit deserving of being in the Big Dance, but nothing it guaranteed, particularly when looking at the remaining schedule for SU. After a solid 67-56 home win over Boston College, Syracuse faces seven remaining games, four on the road and three at home. SU must travel to NC State, host No. 16 Louisville and No. 2 Duke before a road trip against No. 8 North Carolina and Wake Forest. The Orange finish the season with a visit from No. 4 Virginia and a trip to Clemson. To say that poses a lot of potential pitfalls is an understatement. According to ESPN’s BPI, that is the toughest remaining schedule in college basketball. Breaking it down, this final stretch is truly brutal. NC State has hit a rough patch, losing three of the last four. The Wolfpack are a tough team to get a read on after losing by one in overtime to Virginia and following that up with a 24-point showing, the worst by an ACC-team in the shot clock era, against Virginia Tech. It is a coin flip game. Louisville is coming off a loss to Florida State, but the Cardinals have the same record as the Orange and have faced a much tougher schedule to this point. Louisville ranks ninth in the nation for strength of schedule, SU ranks 42nd. On the bright side, Louisville has a midweek test vs. Clemson while Syracuse gets a few days off. Then there is Duke. Obviously, Syracuse won round one of this matchup, but that was without Cam Reddish and only six minutes of Tre Jones. It was 12-0 in favor of the Blue Devils before Jones left the floor injured. The rematch probably won’t go well for the Orange. North Carolina awaits in the Dean Dome. In the history of the program, no team has had more success against the Orange than UNC. All-time ‘Cuse is 4-11, its worst head-to-head record with any team it has seen at least five times. Luke Maye will be a handful on the glass against the zone. 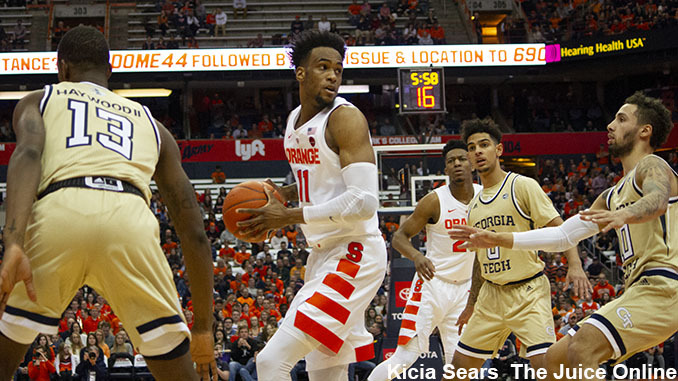 Finally, Syracuse plays a game it is favored in with a trip to Wake Forest. This should be a win for Boeheim’s crew, one it might desperately need. A return home for a matchup with Virginia could prove tricky. The Cavaliers like to play slow and lack a dominant big man. Jack Salt is big, but not the type of rebounder that can wreck the zone. I like the Orange to pull off this upset. It helps this is the home finale as well. The final game against Clemson could be a letdown after (let’s assume) beating Virginia. The Tigers has been fairly middle of the road this season though, facing many of the same issues plaguing the Orange. Plus, ‘Cuse still owes them for that ridiculous football loss. 20-11, 11-7 entering the ACC tournament seems reasonable. That seems like a good enough position to make the tournament, but even getting those three wins will be tough. All three games against unranked opponents are on the road for Jim Boeheim and company. Winning road games in the ACC is not an easy task. Going 19-12 probably is not good enough, especially with a soft out of conference schedule (ranked 179 in the country.) And we learned last year, to Syracuse’s benefit, the committee values a strong out of conference schedule. This final stretch is crucial for a team with a lot left to prove. It overs a rugged path to the tournament, but it also offers lots of opportunities to pull of marquee wins. Consistency, or lack thereof over these final seven games will dictate how Syracuse’s season will be remembered. Chris hails from Westfield, NJ, and is a recent graduate from Syracuse University. He spent his college years playing for the Syracuse Ultimate frisbee team, working at WAER and covering the Orange for the Juice.